UPDATED 8/13/18 8:37PM: To include additional quotes from Our Revolution. 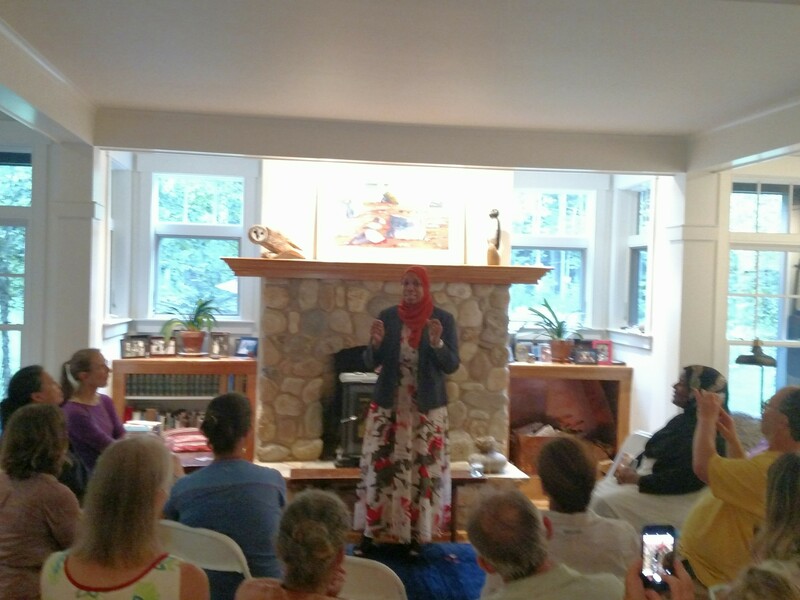 NORTHAMPTON—At a recent fundraiser for Tahirah Amatul-Wadud, supporters gathered around the candidate, packing the hosts’ airy living room in the city’s Florence section. They sat, rapt, as she told her story of her life, career, political awakening, and, ultimately, decision to run for Congress. There was only one problem. The event was just outside the 1st Congressional district where Amatul-Wadud was running. The issue is neither event location nor attendee residency—it is entirely common in politics. In fact, Northampton and Springfield were in the same district for 20 years. 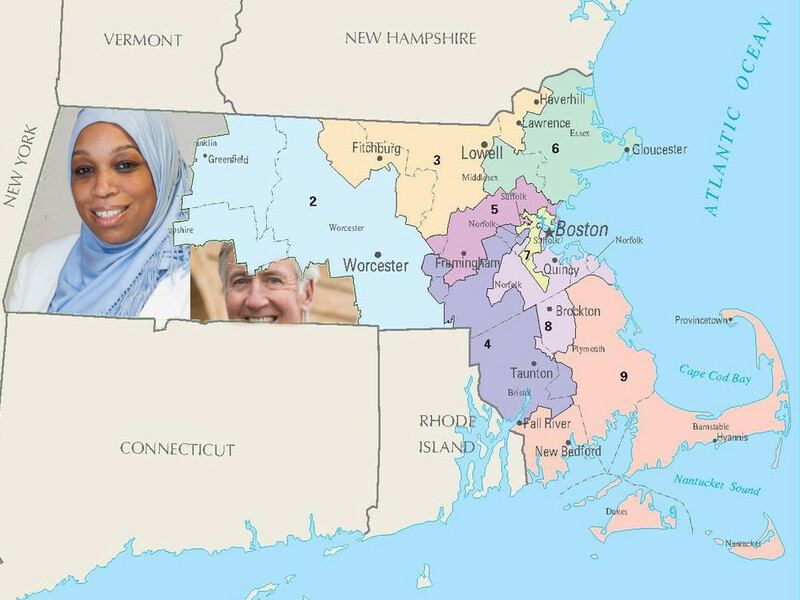 However, it is an allegory for the tension between the two political environments Amatul-Wadud is straddling in order to unseat the incumbent Richard Neal. 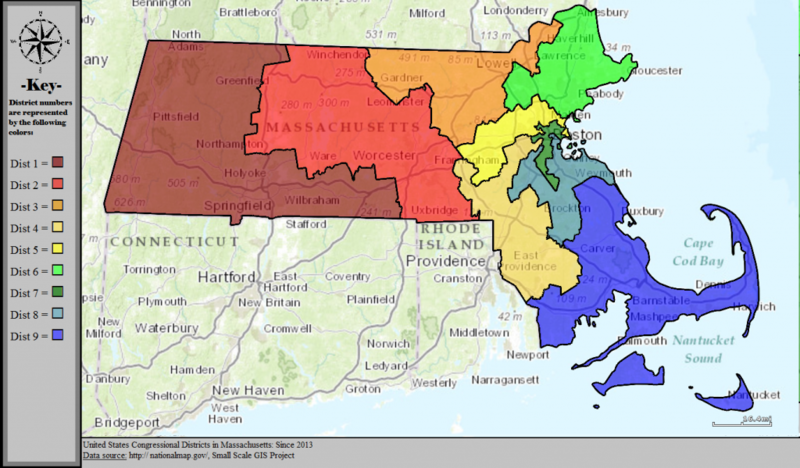 The 1st Congressional District includes virtually all of Berkshire and Hampden counties, Franklin and Hampshire counties’ western fringes, and a southwestern Worcester County. The Democratic primary, open to Democratic and unenrolled voters, is September 4. Nearly 2/3 of the district population in Hampden County. The means Amatul-Wadud must channel her northerly support into the population centers to overcome Neal’s advantages after 30 years in office. Many in the Upper Valley are not Neal fans. Compared to Greater Springfield, the 1st district’s Franklin-Hampshire belt is, admittedly, more activist, more outwardly progressive and certainly more academic—notable as Neal’s non-political career was in education. Though anecdotal, peek into political Hampshire County social media. One will see complaints about his voting record—about 95-97% identical to Northampton’s much-loved congressman, James McGovern. The commentariat also argues PAC-fueled fundraising taints Neal. However, Neal out-raised Amtaul-Wadud among individual contributions, too. Federal Election Commission reports through June 30 show Neal had nearly $3.5 million to Amatul-Wadud’s $37,000. That doesn’t explain Neal’s position, though. Bringing home resources and leaning on federal agencies for constituents has fortified Neal, a popular former Springfield mayor. His time in Washington has increased since becoming the House Ways & Means Committee’s top Dem, but he maintains his ties to the district. Hence Amatul-Wadud is running a two-prong strategy, arguing Neal is absent and insufficiently progressive. It’s a recipe that plays especially well in areas north and northwest of Hampden County. If elected, she promised the crowd at the July 24 fundraiser, “You’ll never have to say, ‘where is the congressman?’” Heads nodded in agreement. This implicit accusation of representative truancy has simmered since areas John Olver once represented joined Neal’s district in 2012. Perhaps further-flung parts of the district have a point, but districtwide the claim seems off. Both candidates live in Springfield. While his campaign started quietly, FEC reports indicate Neal has been staffing up and preparing his field organization for months. All caveats about signs aside, his have been erupting from lawns for about a month across Springfield, which is about a sixth of the district’s primary electorate. The ghosts of the 2016 presidential primary haunt this race, too—Neal endorsed Hillary Clinton, angering many Bernie Sanders voters. Yet, geography seems more relevant. Many ardent Springfield area Berniecrats trust Neal or look forward to him chairing Ways & Means. Even at Amatul-Wadud events in Springfield, her supporters focus on her candidacy. Neal is mentioned—never by name—more with ambivalence than the condemnation found further north. Since Donald Trump’s election, a stampede of women have run for office. The historic nature of her bid—Amatul-Wadud would be among the first Muslim women in Congress—has been an overarching theme. The event was to be a joint fundraiser with Boston City Councilor Ayanna Pressley, another woman of color running against an incumbent congressman. The hosts said Pressley cancelled last minute due to laryngitis and an undisclosed public relations issue. Amatul-Wadud told her story of being a young mother, going to law school, working for legal aid and opening her own firm. 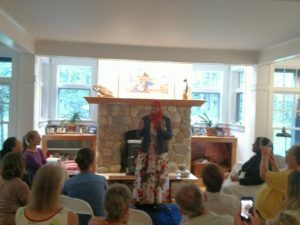 Speaking in front of a fireplace, her bright floral print outfit, dark blazer and burgundy hijab matched the energy of her remarks. “We changed the course of this election just by being in this race,” she declared. She eventually shifted to Neal. Amatul-Wadud implied to the district’s lower wealth was failure of Neal’s and alleged he was reluctant to debate her. Neal’s comment about the seriousness of her campaign left the impression he was avoiding debates, but debate negotiations have been underway for weeks. However, gatherings like this one cannot raise Amatul-Wadud’s name recognition among primary voters. Nor will it persuade them to abandon Neal. The candidate acknowledged most voters were to the south and west in Chicopee, Holyoke, Pittsfield and Springfield. She has been directing her Upper Valley supporters to knock doors in Greater Springfield. At a candidate meet and greet at the Mason Square Branch library in Springfield, Amatul-Wadud was bullish on that strategy. “Hands down, yes,” she replied when asked if it was working. “We all know that wins the race,” Amatul-Wadud continued referring to in-person contact. Rep. Richard Neal in 2011. That persuasion battle is not going unanswered according to Neal campaign manager Peter Panos. 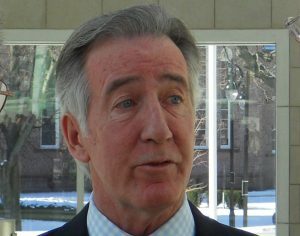 “Congressman Neal, along with our team of volunteers, paid interns, and supporters, have been hard at work talking with voters across the district about his leading the fight against Donald Trump’s inhumane immigration policies, attempts to gut healthcare, slash Social Security and Medicare and cut taxes for corporations and the wealthiest 1-percent,” Panos said in a statement. Maintaining the enthusiasm Amatul-Wadud needs suffered a blow after it was revealed she voted for former US Senator Scott Brown in 2012. The Upper Pioneer Valley overwhelmingly backed the woman who vanquished Brown, Elizabeth Warren. Although first reported by The Republican on August 3, the new appeared on social media as early as July 23. Shock, disbelief, and some resolve met those early postings. In real life, some Amatul-Wadud leaners have privately said they shifted toward Neal. Firmer supporters are sticking with her, but expressed a desire speak directly to her about that vote. Some support has not flagged. Our Revolution, the successor to Sanders’s presidential campaign, endorsed her this week and stuck with her. “What matters most to our members is that Tahirah has stepped up and admitted that she is human like the rest of us and made an error in judgement. We are not defined by one vote or word, but by our actions and the work we accomplish,” Burns said. Amatul-Wadud attributed it to a “lapse in judgment.” Explaining her vote, she also noted Warren supported Brown’s nomination to be ambassador to New Zealand. As to whether it has affected support, she claimed people “recognize that as a distraction.” Yet, she has had to take time to address it and soothe her base. Nearly two years on after Trump’s election, some lessons seem overlearned. Many political dynamics endure. Alexandria Ocasio-Cortez’s shock victory in New York may be the exception that proves the rule. She was heavily outspent, but still dropped $600,000, likely well-targeted in her compact closed-primary. There is another, misunderstood lesson from 2016: recognizing different voters’ perspectives. That can be a beard for racism, but it can also legitimately carry truth given the differing perspectives between the 1st District’s poles. Voters are mad. They have reason to be, especially in and around Greater Springfield. However, those same voters may not blame their Democratic representative or his votes for the region’s troubles. The easy explanation is Neal’s fundraising and favorable press coverage, but that’s unsatisfying. Maybe Amatul-Wadud is the answer, but ultimately Neal’s critics may need more than a progressive scorecard to convince 1st District Democrats the time has come to try something different in Congress.